Will Power gave his championship hopes a lift with a commanding win in Sunday's IndyCar race at Milwaukee, while Juan Pablo Montoya finished second to complete a Penske one-two. Power started from pole and led 228 of 250 laps, but the numbers disguise how hard the Australian was made to work for his first short oval victory. He was pushed hard by Tony Kanaan immediately after the first stops, and was leapfrogged by the Brazilian later when he stayed out longer on his second stint. It took until the next round of stops for Power to get his lead back, but then he had to endure a final stint of navigating traffic while being hunted down by Montoya. Fortunately for him, Montoya was having traffic problems of his own, and Power was able to secure a 2.7-second win. In the process, he extended his championship lead over Helio Castroneves from four points to 39. "Just a perfect day," Power said. "Led a lot of laps, the car was really good ... I'm really, really happy. "It's a perfect start to this 'three race Chase'. We've got two other tracks that I am strong on and enjoy, but I didn't think about points today. I just put my head down." Montoya, whose time lost to traffic was compounded by his missing his marks during his first stop and narrowly avoiding a penalty for hitting his own tyre, felt that his afternoon was an opportunity lost. "I'm really disappointed with second," he said. Third-placed Kanaan was again forced to settle for a podium instead of a win, but he admitted that he had no answer to Power's pace towards the end of the race. "It was a good run, but not what we wanted," said the Ganassi driver. "I think we had the car to win the race, but we missed a little bit on the set-up." 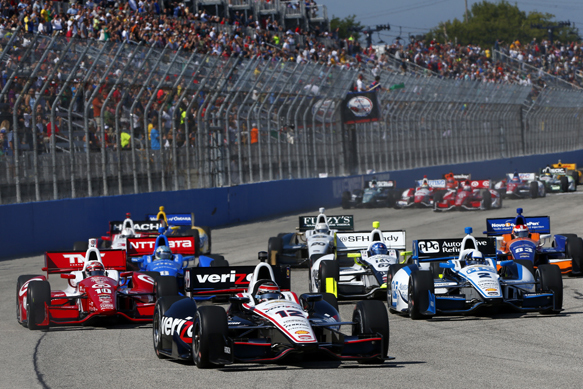 Scott Dixon leaned on an aggressive strategy to climb from his starting position of 11th to fourth ahead of Josef Newgarden, who had been running third in the closing laps before being forced to pit. "I don't know [if I could have made it on fuel]," he said. "We gambled and that's what you have to do in this series. "We worked really hard this weekend. A podium would have been sweet, but top five isn't bad." Castroneves certainly would have taken that after an afternoon spent fighting an ill-handling car left him a lap down in 11th. "If I finished without crashing today, it was a good day," he said. "In Turns 1 and 2 the car wasn't bad - unfortunately, there are two other corners." It was an even worse outing for fellow championship aspirant Ryan Hunter-Reay, who made great early progress from the second-last row to break into the top six, only to have his suspension break and put him out of the race. The Andretti driver was one of only two DNFs from the afternoon; the other coming courtesy of his team-mate Carlos Munoz, who caused the sole caution period when he glanced the wall and was forced to retire. 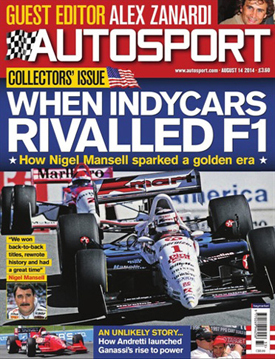 This week AUTOSPORT is revisiting a great era of Indycar competition, with a special August 14 issue of AUTOSPORT magazine, guest edited by Alex Zanardi and a host of features in print and online. IndyCar 2014 versus 1990s CART - what comes out on top?